No, no they’re not.. I tried this as a child.. Still better than peanut jelly and butter sandwiches. Or peanut, butter, and jelly sandwiches (in this order). I like peanut and butterjelly sandwiches. In a sleepy daze I once buttered a piece of bread while making a peanut-butter and jelly sandwich, I used it anyway and had a peanut-butter, butter and jelly sandwich. I liked it. I still make them occasionally though my family thinks it’s weird. Maybe it’s an Aussie thing or something, but I remember doing butter and peanutbutter sandwiches. Could have been a spinoff of Vegemite and butter sandwiches. Both are good. Both I’m now allergic to. Curses! 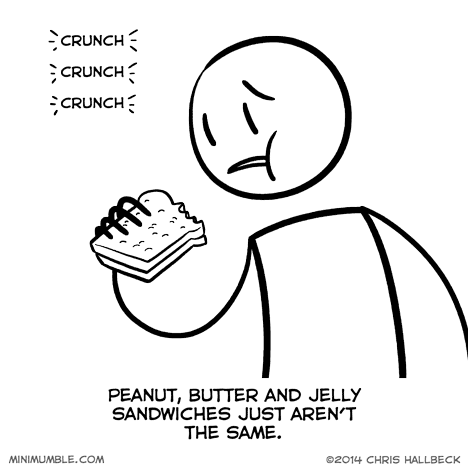 peanutbutterjelly. In the shape of the policepolicepolice of the buffalos.